The job of a car water pump is to keep coolant circulating between the radiator and engine block through the hoses that connect them together. An engine cannot function properly without coolant circulating through its components because they generate a lot of heat while in operation. If those heated components do not get cooled down, they will eventually get damaged beyond repair. Then you will end up having to replace your entire engine. That is why the car water pump is vital in keeping the coolant flowing properly. As you can imagine, there will be a lot of problems if the car water pump were to go bad. You cannot wait to replace the bad water pump because it will quickly damage your engine if you do. Not only that, your driving ability will be greatly diminished. This could put other people’s lives at risk on the road, including your own. For this reason, you need to recognize the symptoms of a bad car water pump and then get your vehicle to a mechanic right away for replacement. Below are the top 5 symptoms of a bad car water pump. 1) Engine Overheating – Since a bad water pump cannot circulate coolant flow in the engine, this is going to cause your engine to overheat. After all, the engine’s moving components won’t be getting cooled down anymore by the coolant. You will notice this problem right away by the needle on your tachometer moving toward the red zone. Now there could be other reasons for an overheated engine, but a bad car water pump is one of those reasons. Get the problem investigated immediately by a mechanic. 2) Smoky Hood – Is there smoke coming out of your hood? This is another symptom of an overheated engine which, in turn, may have been caused by a bad water pump. If you haven’t noticed your tachometer going toward the red zone, you will certainly notice the smoke coming out of your hood. The longer this goes on, the more damage it will cause to your engine. Then you will be looking at thousands of dollars in repairs. It is so much cheaper to just replace the water pump right away. 3) Coolant Leak – A classic symptom of a bad water pump is a coolant leak. If the pump is damaged or worn out, the coolant inside of it will leak out. You will see a puddle of coolant on the ground in front of your vehicle if this happens. Leave your car off for several hours and see if there is a puddle of colorful liquid underneath your vehicle. If there is, then it is definitely your pump’s fault. 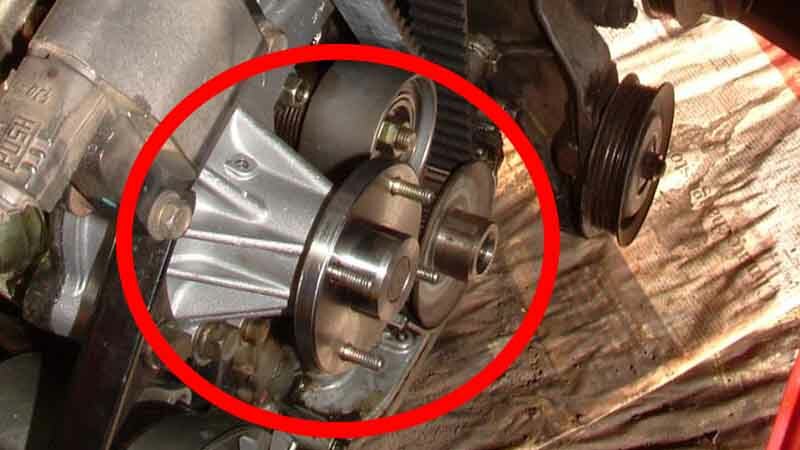 4) Loose Pulley – The drive belt moves a pulley which operates the water pump. If you have a bad water pump, this pulley is likely going to be loose. There are two ways in which you can detect this. First, you can inspect the pulley yourself and see if it is loose. Second, you will hear an annoying whiney sound coming from the front of your vehicle. In this situation, the pulley will need to be tightened and your pump will need replacement. 5) Weak Coolant Circulation – Sometimes your water pump may still be functional, but it won’t be performing up to par. This could be the early signs that your water pump is starting to wear down. Your engine will slowly get hotter, but it won’t overheat immediately. You’ll notice the needle of the tachometer creeping its way toward the right side as the weeks go by. Sooner or later, the engine will be overheated. This is due to poor coolant circulation in the engine. It is the job of the pump to keep the circulation going at a steady pace. If the pump is bad, then that won’t happen.